A native of Nashville and long-time resident of Chicago, Anne was a working drummer for many years. Her drumming influences include Joe Morello (Dave Brubeck), Max Roach, Danny Seraphine (Chicago), Ed Thigpen (Oscar Peterson Trio) and, of course, Tony Williams (Miles Davis). After a successful career in Chicago, Anne moved to Savannah, Ga. Finding few gigs as a drummer, she took up the guitar and found a genuine attraction to the instrument. She opened a first and then a second musical instrument store in Savannah and spent eight years working in retail and learning to play before she performed (for the first time) on guitar in 2008. She sold her businesses in 2008 and now devotes herself full time to music performance. Her loyalties are divided among jazz, r&b, classic rock and blues. 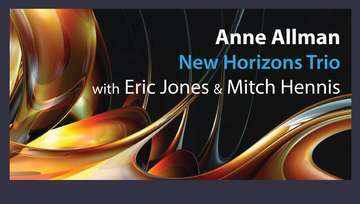 In addition to the New Horizons Trio, Anne is a member of the Allman-Moody Duo and is half of the all female rock duo Early Risers. She currently resides on Wilmington Island. Eric Jones was born in Moultrie, Georgia, and started to play piano by ear at the age of five. At 11, Eric began studying trumpet. At 16 he started formal lessons on piano and within two years, he was awarded a piano scholarship to Andrew College. Eric went on to pursue his education at Armstrong Atlantic State University, studying under Dr. Kevin Hampton, graduating with a B.A. in Piano. In addition to teaching private lessons, composing and arranging, he completed his Masters in Composition from Georgia Southern University, where he studied under Dr. Martin Gendelman. Eric has worked with many prominent artists including Grammy Award winning Esperanza Spalding, Stewart Copland of the Police and Keith Miller of the Metropolitan Opera. In 2011 Eric premiered his latest work, “Songs of Creation,” which combines spiritual, jazz and African influences with the poem of James Weldon Johnson’s “The Creation”. Eric is the pianist with the Savannah Jazz Orchestra and performs with them annually at the Savannah Jazz Festival. Eric has also performed several times during Sunday concerts for Coastal Jazz Association. Currently Eric teaches at Savannah State University. Mitch Hennes was born and raised in Chicago, and started playing music as soon as he could reach the keys of the family piano. After studying piano and violin as a child, he took up string bass at 15 so he could join his high school jazz band. After graduating from the University of Illinois, where he studied bass and composition, Mitch returned to Chicago and began his career as a studio recording engineer and free-lance musician. After several years he left the studio to play full-time and formed The Numa Band, a seven-piece electric jazz ensemble that played Mitch’s original music and made one of the first commercially released digital albums in the U.S. During the mid-eighties Mitch began writing and producing music for radio and TV commercials, corporate and educational video, animated cartoons, and had commissions from the Joffrey Ballet of Chicago and the St. Cloud Minnesota Symphony. Mitch moved to Savannah in 2011 after spending 6 years in St. Croix, U.S. Virgin Islands, teaching and performing.